Whenever I visit the Asia-Pacific region I am impressed by its dynamism and the many successes its people have achieved, not least of which was meeting the goal of halving the proportion of hungry people in region under the just-concluded Millennium Development Goals (MDG) effort. Now, the new successor to the MDGs – the global Sustainable Development Goals (SDGs) – has set the bar higher, placing the complete eradication of hunger and major improvements to nutrition as targets. Globally, the will is there, and, with the energy that countries in Asia and the Pacific have shown in recent years, the region can again play a leadership role in this bold effort. But it’s not time to take a victory lap, not just yet. Successes haven’t been even, and with 490 million people across Asia and the Pacific still suffering from undernutrition – that’s 62 percent of all hungry people in the world – the battle is far from over. Indeed, the road to a Zero Hunger world will not be an easy one and the challenges -- here in the region and across the planet -- are as many as they are complex. For one, we’ll need to produce more – and more nutritious – food to feed a rapidly growing world population projected to top nine billion people by 2050. (Asia is expected to account for most of that growth.) Doing so, we’ll have to take better care of the environment – using ever-more-scarce natural resources with greater care, doing less damage to Mother Earth. Meanwhile climate change and the increasing frequency of natural disasters – which affect this region more than any other – are creating great uncertainty. This will make farming even riskier, especially for family farmers – witness the recent droughts in Thailand and Cambodia and heavy flooding in Myanmar. These are among the key challenges that national policy makers responsible for their countries’ food security are wrestling with this week as they gather in Putrajaya, Malaysia, for FAO’s Regional Conference for Asia and the Pacific. I am confident that together, pooling their knowledge and sharing a common commitment to joint action, they will help the region advance down the pathway to Zero Hunger. We already have some clear ideas where more action is needed. Many of the nutritional challenges facing Asia and the Pacific persist mainly because a lack of purchasing power, limits to physical access to food, and the spotty coverage of social protection programs. Some Asian countries have made significant efforts in developing and strengthening such systems, but more is required. The expansion of social protection systems to all, particularly the poorest and most vulnerable, is fundamental. Also key, as mentioned, is paying close attention to the nutritional quality of the food we’re producing. Producing more food, while important, is not the sole answer. We must feed people well. Family farmers need to be much more integrated into food systems. So far, they haven’t fully benefited from rapid economic growth in the region and the resulting surge in demand for higher-value food products. If we empower them as fully connected players in food value chains, they’ll be able to boost their output, earn more, eat better, and act as engines for rural economic growth. Additionally, we must continue to innovate, trying out new tactics such as the Blue Growth approach to fisheries and aquaculture, being widely embraced across the Asia-Pacific. Future successes in food production will require creativity -- and more research and development. The region has the academic talent to find those solutions, provided governments invest in public goods and create an enabling environment to encourage the private sector to also chip in. Past successes and progress in Asia and the Pacific bode well for the future. With the Green Revolution this region achieved tremendous increases in food and agricultural production and emancipated hundreds of millions of people from poverty and hunger. Asia and the Pacific has shown that with human ingenuity and hard work, nothing is impossible. Working together, the region can and will be an international leader in the SDG-era push to finally eradicate hunger and malnutrition, once and for all. 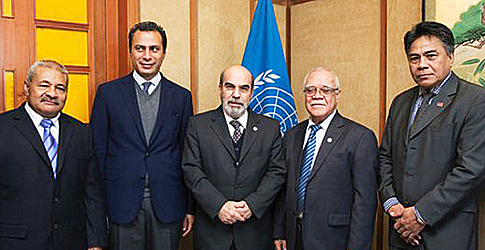 *The author, Tagaloa José Graziano da Silva, is Director-General of the Food and Agriculture Organization of the United Nations (FAO).